We know that there will undoubtedly be snide remarks about Apple Maps, but we will continue to remind people that if you expect Apple Maps to forever stay a bad product, you are willingly letting your dislike of Apple blind you to reality. What may not be a good product now can only get better. And, with that in mind, it looks like the next move for Apple may not be into TVs, as many expected, but into the automotive world. We have already heard Apple talk about the possibility of partnering with car manufacturers in order to integrate Siri into cars, and we have seen the proliferation of "iPod compatible" systems in cars, which have in turn led to "iPhone compatible" systems. Then, after Scott Forstall left the company and Eddy Cue took over, something else interesting happened: Eddy Cue was also named to the board of Ferrari. This is by no means a smoking gun, but the link needn't be all that strong, because we already know that mobile platforms want to be in cars. Cars are a blossoming market for mobile platforms, and Apple certainly doesn't want to be left behind. Ford SYNC can connect with iPhone and various Android devices for calling, messaging, and audio streaming. Android has been behind a ton of devices for cars from stereos to navigation systems to entertainment centers that have been shown at CES for the past few years. Although, many of those systems have been non-Google Android, and Google Voice Search/Google Now would be a much better option for cars, but as yet Google hasn't really shown much on this front. Apple of course has already shown off the "Eyes Free" plans with Siri as part of the iOS 6 announcement. Apple already has plans to integrate iOS more into cars with partners like BMW, General Motors, Land Rover, Jaguar, Audi, Toyota, Mercedes-Benz, Honda, and Chrysler. In these cars, the system sounds like it would work much like Ford SYNC, where you'll have a button on the steering wheel which will activate the voice command system (in this case, Siri). And, using your voice, you'll be able to control media playback, as well as make calls and send messages via a Bluetooth linked iPhone. It should be interesting to see where this goes, and what other platforms like Windows and BlackBerry have to show for this new space. Apple could certainly offer a pretty impressive set of features if it were to move beyond the "Eyes Free" plan and moved on to simply having iOS installed on touchscreens in cars. Siri could still handle most commands, calling and messaging could be built-in or activated through Bluetooth (because you still want people to have to buy iPhones of course), and with the iTunes App Store there would be plenty of games, and media apps like Netflix or Spotify to keep entertain anyone in the car. Sure, maps need to be improved, but Apple is definitely working on that, and any more full-fledged iOS system in a car is likely still at least a year away, if not more. By the time any system like this actually made it into a car, it's not hard to believe that Apple could have made some headway in the effort of improving maps. Yeah, Apple is so terrible! Boo Apple! They're so greedy! 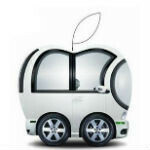 Here it is...Apple on cars...iDrive!! Ford, Chevrolet, Ferrari, Audi....++ be-careful, the king of Patents is soon taking over your designs!! Start praying!! they will soon Sue them for the shape of the car and 4 wheels ....oh no u don't 4 wheels only belong to Apple !!! Cool. Get ready for your insurance too. and a paper map, helmet and another phone with 911 in speed dial.. Cool beans, although distracted driving may be an issue if teenagers are playing Angry Birds on their cars the whole time... dagnabbit! If this is indeed true, $5 says they'll either patent the steering wheel or tires. iCar made in China. Sounds awesome! google has it's own car.. "self-driving car"
No thanks. I will take google's self drive any day. I was telling this two years ago. At that time, I watched Deutche Welle TV poll that resulted with the fact that more people in Germany like their (i)Phones (!) more than their cars, which is somewhat unprecedented for the state-symbol of automotive industry. Automotive industry is in cultural crisis as it lost its significance. Except trying to ride on a wave of eco-movements, they are trying to borrow and implement mobile/information tech in cars but it's really not percievable by our culture. Then I realised - the car waits for it to be reimagined. Then I naturally connected the conclusion with Apple, and then I heard Steve Jobs was actually planning to make Apple car. However, to do this, car must stop being a car. It must become a gadget. It can be only done with attaching a signifier (like Apple logo) and design approach that doesn't follow usual automotive rules. Well, since everyone is not doing anything about that, I presume Apple will take this opportunity and become an industry leader - again. BMW could actually run for it's money just like Nokia now does, all because of Apple. It's a conspiracy allright, because I cannot believe the rest of the industry is so stupid. Anyhow, since there is not Steve Jobs around, it could be proven as an epic failure, especially because nowadays Apple loses their significance and cult value. That is, of course, if they decide to enter this business at all.